Get to know some basic video vocabulary before you begin shopping for a video display for your home theater system. Your display can be a direct-view television, a rear-projected television, a front-projected screen, a plasma or LCD screen, or even a wall (for a projection system). Resolution: In general, resolution is basically the level of detail that your eyes can resolve, or see, on the screen. The resolution of video systems are typically described by the vertical dimension — usually by measuring the scan lines that move across your screen (from left to right) and by adding the number of these lines stacked on top of each other. Video systems typically display 480, 720, or 1080 of these lines, though some displays — many plasma TVs, for example — have a nonstandard number of lines such as 768. Fields and frames: Frames are a holdover from the film world, where each individual picture on a reel of film is called a frame (and 24 of them flash by the projector bulb each second). 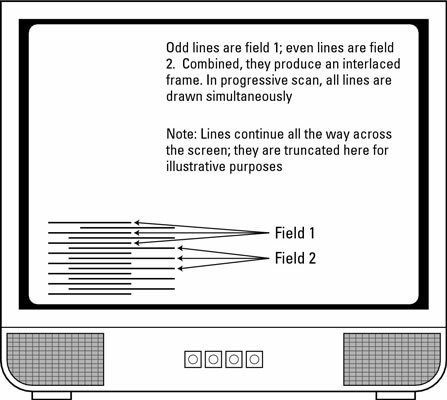 When TV was developed, the technology of the day wouldn’t allow full frames to be displayed at the rate at which TV signals worked, so each frame was divided into two fields, each of which contained half the number of scan lines (all the odd lines in one field, and all the evens in the other). Traditional TV systems display 60 fields every second — 30 frames per second — but the newest systems can be capable of up to 60 frames per second. Progressive scan systems draw all the lines (a whole frame) at the same time and can help reduce these characteristics. The effect is a picture that is more like film, which is what you’re shooting for in a home theater. Comparing interlaced and progressive-scan video.